The aim of this study was to isolate Staphylococcus aureus from samples of cow's milk obtained from different farm settings and to determine their antibiotic susceptibility patterns. Gram staining, oxidase, catalase, DNase, haemolysis and the MASTASTAPHTM rapid agglutination tests were employed for bacterial identification. A total of 28 milk samples were collected and screened for the presence of S. aureus. All the samples were contaminated with S. aureus. A total of 240 S. aureus isolates were obtained during this study. The levels of contamination with S. aureus were higher in milk obtained from the communal farms in Lokaleng and Mogosane (24.6% and 35.4%, respectively) compared to the commercial farms in Rooigrond and Molelwane (17.9% and 22.1%, respectively). A large percentage of the S. aureus isolates (39%100%) from both communal farms was resistant to methicillin (MT), ampicillin (AP), penicillin G (PG), sulphamethoxazole (Smx), oxytetracycline (OT), erythromycin (E), nitrofurantoin (NI) and streptomycin (S), but not vancomycin (V). An even higher percentage (64.2%  100%) of the isolates from both commercial farms was resistant to sulphamethoxazole and nitrofurantoin. A comparably smaller percentage (3.4%  4.7%) of the isolates from both communal farms was resistant to vancomycin, but all isolates from commercial farm milk were susceptible to this drug. The predominant multiple antibiotic resistant phenotypes for isolates from the commercial farms were AP-Smx-NI and MT-AP-PG-OT-Smx-NI for Rooigrond and Molelwane farms, respectively, while those for isolates from the communal farms were MT-AP-PG-Smx-E-NI-S and MT-AP-PG-OT-Smx-NI-S for Lokaleng and Mogosane, respectively. When comparing the percentage of antibiotic resistance, a significant positive correlation was observed between the isolates from the commercial farms (r = 0.966, p < 0.01). S. aureus is normally resident in humans, therefore, the S. aureus present in the cows may have resulted from transmission between the two species, emphasising the need to improve sanitary conditions in the milking environment. Staphylococci are normal inhabitants of the skin and mucous membranes of animals and humans. Pathogenic strains are usually coagulase-positive1 and have been found to cause disease in their hosts throughout the world.2,3 Diseases in cattle caused by Staphylococcus aureus range from simple abscesses and mastitis to the more severe toxic shock syndrome.2,3,4 Milk is an excellent growth medium for a large number of micro-organisms, including S. aureus.5 Bacterial contamination of milk usually occurs during the milking process and this depends on the sanitary condition of the environment, utensils used for milking and the milking personnel.5 It could also result from micro-organisms that enter the udder through the teat opening canal.5 Mastitis in cattle is caused by different types of micro-organisms which include Escherichia coli, S. aureus, Streptococcus agalactiae, Streptococcus dysagalactiae, Streptococcus parauberis and Streptococcus uberis.6,7 The prevalence of mastitis and its associated pathogens in animals can be reduced by improving on the farm management techniques within the dairy industry.8 It is thus of paramount importance to ensure that proper hygienic practices are enforced in both the area where the animals are kept and the milking environment. Determination of levels of S. aureus and an evaluation of the antibiotic-resistant phenotypes of the isolates could serve as a tool for determining the hygiene standards implemented during milking. Data on antibiotic resistance could also be used to characterise these opportunistic pathogens, which may further limit the risks associated with the consumption of contaminated milk and its products.18 The aim of this study was to isolate S. aureus from milk obtained from both communal and commercial cattle and further characterise these isolates using their susceptibility patterns to nine selected antibiotics. Cow's milk samples were collected from commercial farms in Rooigrond and Molelwane and communal farms in Lokaleng and Mogosane. These farms are situated in the North West province of South Africa. Samples of approximately 10 mL of fresh milk were collected from seven milking containers per farm and transferred into sterile sample collection bottles. The samples were immediately transported on ice to the Animal Health Microbiology Laboratory of the North-West University  Mafikeng Campus for analysis. Upon arrival in the Laboratory, samples were analysed immediately. Ten-fold serial dilutions were performed using 2% peptone water and aliquots of 100 µL from each dilution were spread plated onto mannitol salt agar (MSA) (Biolab, supplied by Merck, Johannesburg, South Africa). The plates were incubated aerobically at 37 ºC for 18 h  24 h. Consequently, the 20 characteristic S. aureus colonies that were yellow in colour from each MSA plate were further purified by subculturing onto MSA plates (Biolab, supplied by Merck) and the plates were incubated aerobically at 37 ºC for 18 h  24 h. These isolates were retained for further bacterial identification. Gram staining was performed19 and Gram-positive cocci that occurred in clusters under the microscope were subjected to preliminary biochemical tests (the catalase and oxidase tests). The identities of the isolates were confirmed based on positive results for the DNase test, beta-haemolytic patterns on blood agar enriched with 5% (v/v) sheep blood and the rapid latex agglutination slide test for S. aureus using the MASTASTAPHTM (RST-101, Mast Diagnostics, Merseyside, United Kingdom). The slide agglutination test was performed according to the manufacturer's instructions. Briefly, cells from a pure colony were placed on the black area of the paper provided in the kit using a sterile toothpick and a drop of the MASTASTAPHTM reagent was added. These were mixed using the toothpick and the isolates were identified based on the production of clumping factor and/or protein A. Isolates that produced clots were recorded as S. aureus and maintained at 4 ºC in 30% glycerol for further characterisation by antibiotic susceptibility testing. Statistical analysis was done using SPSS25. Pearson's correlation product of moment was used to determine whether the antibiotics tested exhibited similar reactions against S. aureus isolated from the different sampling stations. The two-tailed test of significance (p < 0.01 and p < 0.05) was used and the correlation value obtained was considered highly significant at p < 0.01. (Table 2). S. aureus was obtained from each of the 7 samples taken per farm, giving a prevalence of S. aureus of 100% for the 28 samples (Table 2). The results demonstrated the presence of S. aureus in all the milk samples, regardless of the farm setting. However, the levels of contamination with S. aureus were higher in milk samples obtained in Lokaleng and Mogosane (24.6% and 35.4%, respectively) than those from Rooigrond and Molelwane (17.9% and 22.1%, respectively) (Table 2). Table 3. A large proportion of the isolates from both commercial farms (64.2% to 100%) were resistant to sulphamethoxazole and nitrofurantoin while a similarly large proportion of those from the communal farms (64.4% to 100%) were resistant to methicillin, ampicillin, penicillin G, sulphamethoxazole, erythromycin and nitrofurantoin. A general observation is the large percentage of methicillin-resistant S. aureus (MRSA) was isolated from the communal farms. These were also resistant to several other antibiotics. Only a small proportion of the isolates from the commercial farms (3.8% to 16.3%) were resistant to methicillin, penicillin G, ampicillin or oxytetracycline. None of the isolates from Rooigrond commercial farm were resistant to erythromycin while a small proportion (1.9%) of those from the Molelwane commercial farm was resistant to this antibiotic. A large proportion (90.6%) of the S. aureus isolated from the Mogosane communal farm was resistant to streptomycin. On the other hand, 45% of the isolates from the Lokaleng communal farm was resistant to this antibiotic. The scenario was different for the commercial farms, where 4.7% and 26.4% of isolates from Rooigrond and Molelwane, respectively, were resistant to streptomycin (Table 3). Furthermore, none of the isolates from either of the commercial farms were resistant to vancomycin, while a relatively small proportion of those isolated from both communal farms (3.4% to 4.7%) was resistant to vancomycin. MAR phenotypes were determined for S. aureus isolated from milk obtained from all the farms (Table 4). 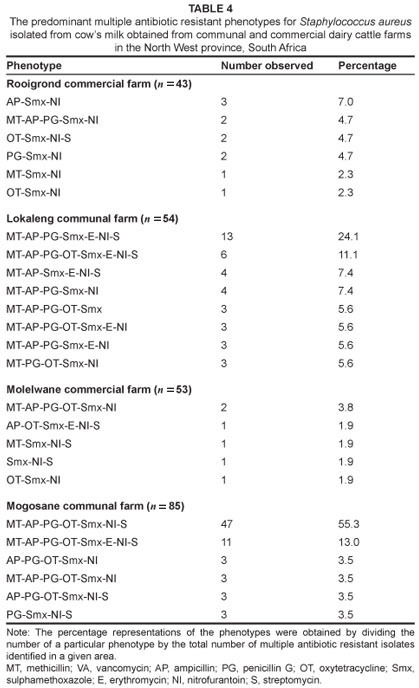 The predominant MAR phenotypes for S. aureus isolated from the commercial farms at Rooigrond and Molelwane were AP-Smx-NI and MT-AP-PG-OT-Smx-NI in 7.0% and 3.8% of the isolates, respectively. Furthermore, MAR phenotypes MT-AP-PG-Smx-NI, OT-Smx-NI-S and PG-Smx-NI were obtained in 4.7% of the isolates from the Rooigrond commercial farm. The MAR phenotypes MT-AP-PG-Smx-E-NI-S, MT-AP-PG-OT-Smx-E-NI-S, MT-AP-PG-Smx-NI and MT-AP-Smx-E-NI-S were the predominant ones (24.1%, 11.1%, 7.4% and 7.4%, respectively) among the isolates obtained from the Lokaleng communal farm (Table 4). MAR phenotypes MT-AP-PG-OT-Smx-NI-S and MT-AP-PG-OT-Smx-E-NI-S were predominant in 55.3% and 13.0% of the isolates, respectively, for those obtained from the Mogosane communal farm. Phenotypes AP-PG-OT-Smx-NI, MT-AP-PG-OT-Smx-NI, AP-PG-OT-Smx-NI-S and PG-Smx-NI-S were all observed at a frequency of 3.5%. It was clear that Smx-NI formed the basis of the MAR phenotypes for S. aureus isolated from the commercial farm while PG-Smx-NI formed the basis of the MAR phenotypes for the communal farm isolates (Table 4). It is thus evident that MAR S. aureus was isolated from all four farms sampled. However, among the isolates from the commercial farms, 11.4% and 25.7% of the isolates obtained from Rooigrond and Molelwane, respectively, were MAR S. aureus. The scenario for the communal farms was different. In this case, 60.9% and 82.3% of the isolates obtained from Lokaleng and Mogosane, respectively, were MAR S. aureus. None of the isolates from Rooigrond commercial farm were resistant to more than six of the antibiotics tested. However, 3.8% of the isolates from the Molelwane commercial farm were resistant to 6 antibiotics. Although none of the isolates from either of the communal farms were resistant to all the drugs tested, resistance to seven or eight of the antibiotics tested was frequently observed (Table 4). These were mostly MRSA and this is cause for concern. A comparison of the percentage of antibiotic resistance for S. aureus isolated from milk obtained from all the farms revealed a strong positive correlation between the isolates from both commercial farms (r = 0.966, p < 0.01). This indicated that the antibiotics tested exhibited similar reactions to both sets of isolates, which explains the similarity in the resistance patterns observed. In this study we describe the isolation and antibiotic susceptibility characterisation of S. aureus from milk obtained from two different dairy cattle farm settings  communal and commercial settings. Our results indicate that all the samples were positive for S. aureus and that more of these bacteria were positively identified from milk obtained from communal farms (24.6% and 35.4% for Lokaleng and Mogosane, respectively), compared to the commercial farms (17.9% and 22.1% for Rooigrond and Molelwane, respectively). Several studies have been conducted to evaluate the prevalence of S. aureus in milk obtained from communal and commercial farms.12,26,27 The results reported in our study are similarly high when compared to those previously documented.12,27 Although the prevalence of S. aureus has been reported to vary with the size and geographic region of the area sampled, a high proportion of these bacteria in milk relates to poor hygiene practices. Based on observations made during the collection of samples, we therefore report that improper hygiene and poor farm management practices contributed to the presence of S. aureus in the milk, especially in those from the communal farms. In the communal settings, milk was obtained from animals by farmers who at times did not wash their hands and/or the utensils and containers used. In certain cases, untreated groundwater was used to wash the containers that were used for milking. This may have contributed to the high level of S. aureus isolated. Improving the hygienic conditions of the milking environment and/or utensils may reduce the prevalence of S. aureus in milk and prevent its transmission to humans. A further objective of the study was to characterise and compare the antibiotic-resistance profiles of S. aureus isolated from the communal and commercial farms sampled. The motivation for this was the fact that previous studies conducted in the sample area revealed high levels of MAR bacteria.21,22 Furthermore, the presence of antibiotic-resistant S. aureus has been reported to negatively affect the treatment of its associated infections in humans and animals.11,14,22 We therefore believe that an investigation of the antibiotic-resistance profiles of these isolates may serve as a tool in assessing both the sanitary conditions employed during milking and the health risks that humans may encounter when infected by antibiotic-resistant strains. Sulphamethoxazole and nitrofurantoin were the drugs to which a large proportion of the isolates were resistant (Table 3). As shown in Table 3, between 64.2% and 100% of the isolates from both commercial and communal farms were resistant to these two drugs. Contrary to our observations, a previous study reported that only a small percentage (15.7% to 19%) of S. aureus isolated was resistant to sulphamethoxazole while none were resistant to nitrofurantoin.28 The latter study investigated S. aureus contamination of meat. These two drugs are not used in dairy cattle farms in the sampled area of the North West province. The finding that a large number of S. aureus were resistant to sulphamethoxazole and nitrofurantoin is, however, a cause for concern and should be further investigated. A large proportion (45.8% to 90.6%) of the isolates from the communal farms was resistant to streptomycin compared to a smaller proportion (4.7% to 26.4%) of the isolates from the commercial farms (Table 3). The larger percentage (90.6%) is attributed to the isolates from the Mogosane farm. Tetracycline-resistant isolates were less frequently observed among isolates from both commercial farms (7.0% to 9.4%) when compared to the communal farms (39% to 85.9%). The proportions of tetracycline-resistant isolates identified vary among studies.5,12,29 Except for the results of the isolates from the communal farms, our results correspond to prevalence rates reported in some of these studies.5,12 Moreover, a similar trend in which the prevalence of tetracycline-resistant S. aureus was higher amongst the isolates from the communal than the commercial farms has been documented.30 However, both commercial and communal farmers in the area frequently use tetracycline to treat diseases in animals, mainly because it is easily accessible.22 It is thus our view that the results obtained in this study do not accurately reflect the usage of this antibiotic on commercial farms. We cannot explain this phenomenon. Erythromycin resistance was almost non-existent in the commercial farms. Despite the fact that a significantly larger number of S. aureus isolated from both communal farms was resistant to erythromycin, it was evident from our results that this antibiotic is not frequently used in animals by large-scale farmers. All the isolates from the two commercial farms were susceptible to vancomycin. Only 3.4% and 4.7% of the isolates from the communal farms were resistant to this drug. The results presented herein are similar to previous studies in which Gram-positive bacteria were generally susceptible to vancomycin.5,17,26,27,29,31 This drug is no longer used in veterinary medicine in many countries,32 including South Africa, which may account for the results reported here. Small proportions (3.8% to 9.3%) of the isolates from both commercial farms were resistant to the beta-lactam penicillin G, when compared to the isolates from the communal farms, in which 69% to 98% were resistant. The antibiotic resistance obtained for S. aureus isolated from the commercial farms does not correlate with the extensive usage of penicillin on dairy cattle farms in South Africa. The ampicillin-resistance pattern for isolates from these two sets of farms were similar to the penicillin G resistance pattern, thus a larger proportion of the isolates from the communal farms were resistant to this drug when compared to the isolates from the commercial farms. Ampicillin is also commonly used on dairy cattle farms in the study area and once again this aspect is not reflected in the results when one considers the resistance profiles of this antibiotic among the S. aureus isolated from the commercial farms. Furthermore, isolates that are resistant to penicillin may co-select for resistance to ampicillin and vice versa. Resistance to penicillin G is thus used as a marker to assess the susceptibility of S. aureus isolates against other beta-lactam antibiotics.15,32 This correlates with our findings but suggests that further studies need to be conducted to determine the exact inter-relation between these drugs in the expression of antibiotic-resistant phenotypes on dairy cattle farms in the North West province of South Africa. The methicillin-resistance pattern had a similar trend to that of several of the previously discussed antibiotics, that is a larger number of methicillin-resistant isolates were obtained from the milk from communal farms than from the commercial ones. The results from the commercial farms were similar to those of a previous study27 in which only a small proportion (6.4%) of the isolates were resistant to methicillin. What is of concern is the large number of MRSA (81.2% to 93.2%) that were isolated from the communal farms. High levels of MRSA have been identified in patients in the United States and some European countries.33 In these countries, 44.4%, 34.7%, 41.8% and 32.4% of isolates from patients in the United States, France, Italy and Spain, respectively, were resistant to methicillin. These levels, however, are lower than those in our study. Methicillin is not used on dairy cattle farms in the North West province of South Africa. However, methicillin resistance could be explained by the inter-relationship between beta-lactam resistance and resistance to this drug. In MRSA, methicillin resistance is conferred by the penicillin binding protein (PBP) 2a that is encoded for by the mecA gene.34 PBP2a does not readily bind the beta-lactam moiety. However, in MRSA that are exposed to beta-lactam antibiotics, this PBP2a would contribute to the resistance by providing transpeptidase activity to the native PBPs during cell wall synthesis. In our study, the resistant phenotype MT-Ap-PG was frequently identified among MRSA isolates, usually with the addition of one or more antibiotics (Table 4). It is thus recommended that future studies should confirm the presence of the mecA gene in observed MRSA. It has also been documented that MRSA isolates that are resistant to beta-lactam antibiotics may develop induced resistance to vancomycin.31 All the isolates from both communal bacterial populations that were resistant to methicillin were also resistant to vancomycin and penicillin G. We therefore suggest that this may account for the identification of vancomycin-resistant isolates in the study because vancomycin is not used in either veterinary or human medicine in the area.32 Moreover, beta-lactam-induced vancomycin-resistant MRSA are not easily detected by conventional antibiotic susceptibility tests35 and this may also account for the very low proportion of vancomycin-resistant S. aureus observed. The MAR phenotypes (Table 4) obtained in the study correlated with the percentage of antibiotic resistance. Although the development of resistance to a particular antibiotic depends on the level of exposure to the antimicrobials,13 there are many other factors that are involved. We are therefore suggesting that molecular methods be used to characterise these isolates for the presence of antibiotic-resistance determinants, which may provide data to support our conclusions. A significant positive correlation was observed when the percentages of antibiotic resistance for S. aureus isolates from both commercial farms were compared. This indicated that the isolates from both commercial farms exhibited similar susceptibility patterns against the drugs tested compared to those from the communal farms. Moreover, S. aureus is normally resident in humans; therefore the S. aureus present in the cows may have resulted from transmission from humans, which raises questions regarding the hygiene practices followed. S. aureus was isolated from all milk samples obtained from commercial and communal dairy cattle farms in the North West province of South Africa. A large proportion of the isolates obtained were resistant to three or more antibiotics. These were also resistant to methicillin. This was particularly the case in the communal setting and is cause for concern. The high level of MAR S. aureus and the implications thereof warrant further investigation. One of the aspects that needs to be investigated is the cause of the observed resistance phenotypes. Furthermore, impacts and dynamics of genetic antibiotic determinants should also be investigated using molecular methods. This work was supported by funds made available by the Department of Animal Health, North-West University: Mafikeng Campus. We wish to thank the Laboratory technician Ms N.D. Lesaoana for her assistance. The contributions by Mr L.E. Motsei and Mr B.L. Goitsile during the collection of samples are appreciated.